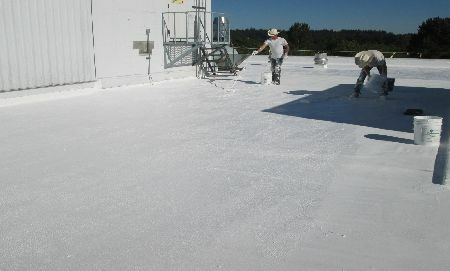 AFTER FINAL COAT OF SURECOAT. 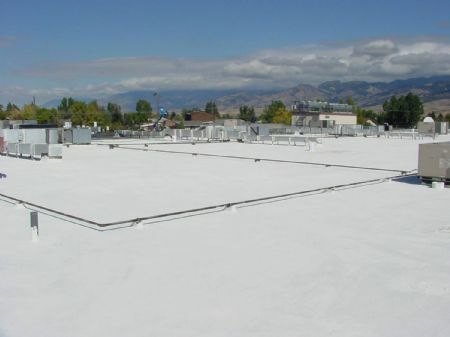 THIS ROOF NOW HAS A 10 YEAR RENEWABLE WARRANTY WITH PONDING WATER COVERAGE. 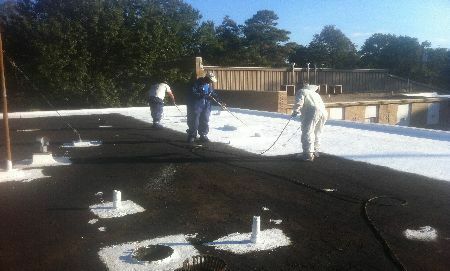 CHURCH LOCATED IN MISSISSIPPI WITH AN EXISTING TAR AND GRAVEL ROOF. 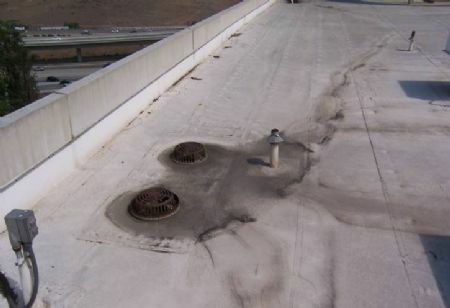 THIS GRAVEL ROOF HAS PONDING WATER AND LEAKS THROUGHOUT. 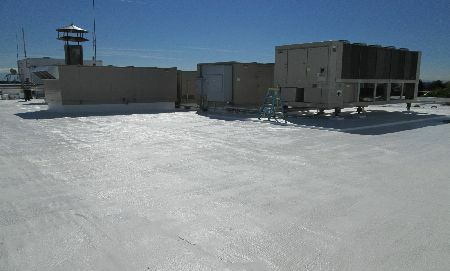 USING SCS SPECIALIZED RECOMMENDATIONS, VETS AT WORK CONTRACTING WAS ABLE TO MAKE THE PROFILE OF THIS GRAVEL EMBEDDED ROOF SMOOTH AND READY FOR THE APPLICATION OF THE SURECOAT ROOF SYSTEM. 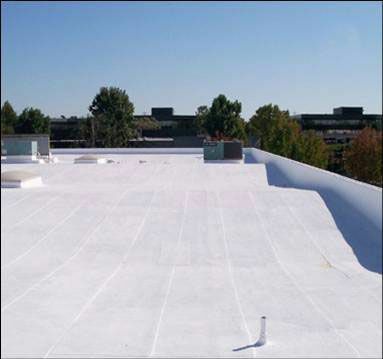 BY PROFILING THE EXISTING GRAVEL ROOF, THIS SURECOAT SYSTEMS APPROVED CONTRACTOR SAVED APPROXIMATELY 20% ROOF COATING MATERIALS. 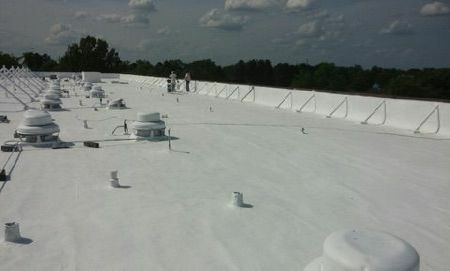 COMPLETED SURECOAT ROOF SYSTEM WITH THE BEST ROOF WARRANTY IN THE INDUSTRY! 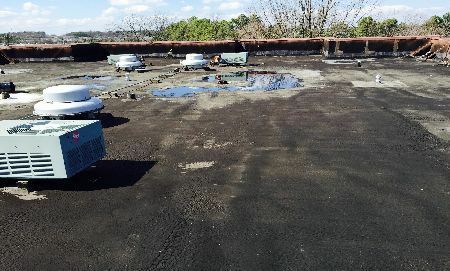 ASPHALT ROOF OF REAL VALUE INN, LOCATED IN MEMPHIS, TENNESSEE. 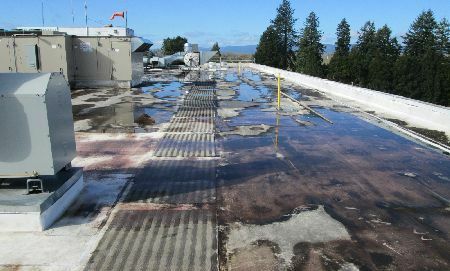 PONDING WATER AND LEAKS THROUGHOUT THE ROOF. 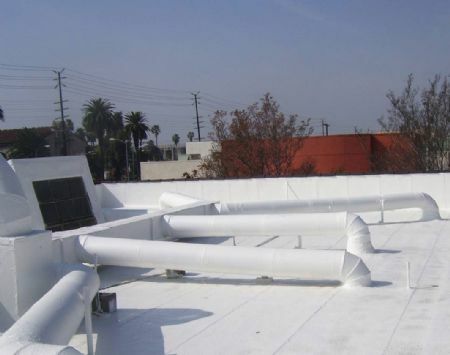 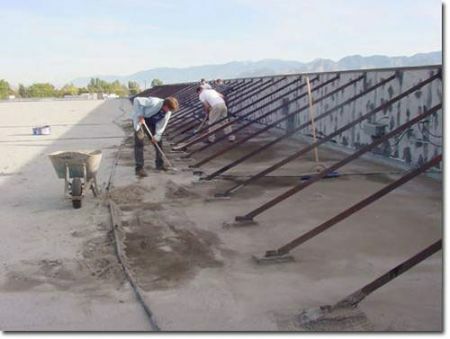 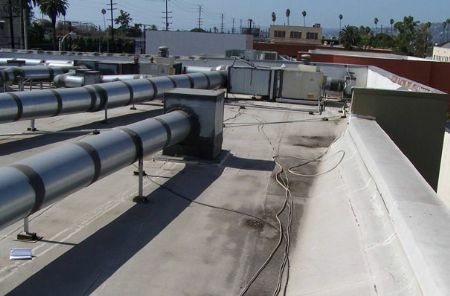 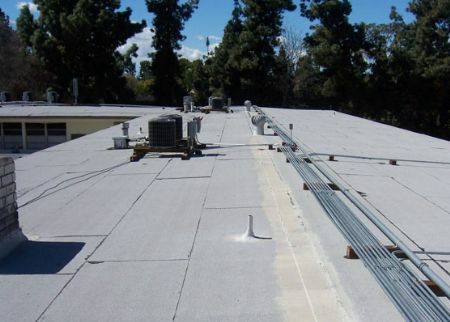 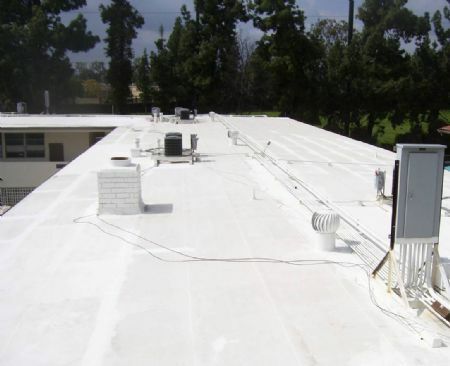 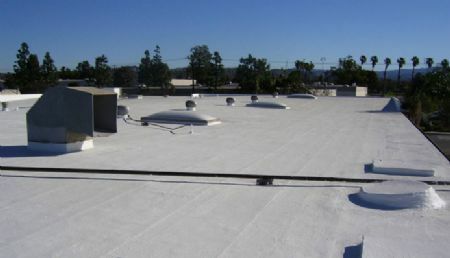 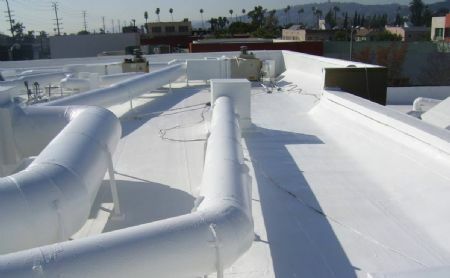 11 YEAR OLD SURECOAT ROOF SYSTEM OVER COMBINATION OF SPF & ROLLED CAP SHEET BUR ON DESIGN COMPANY IN TORRANCE, CA. 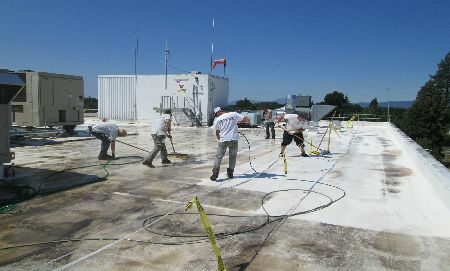 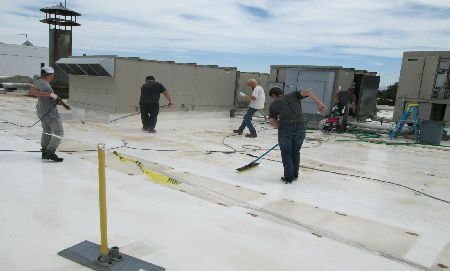 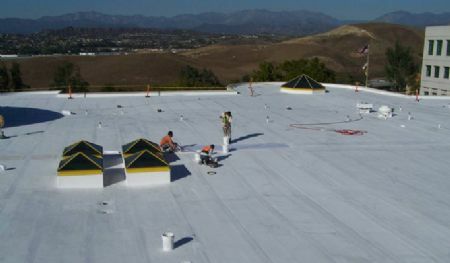 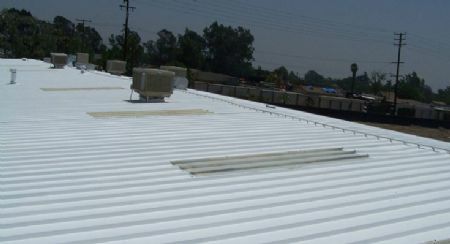 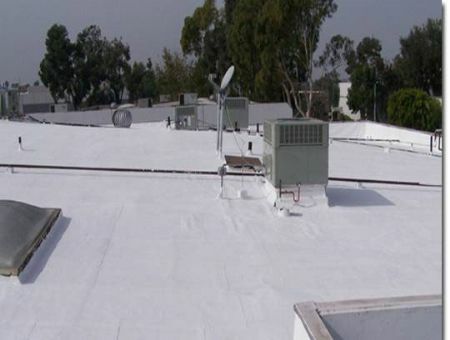 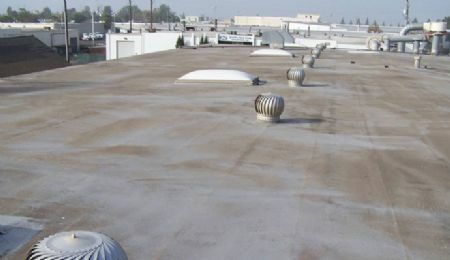 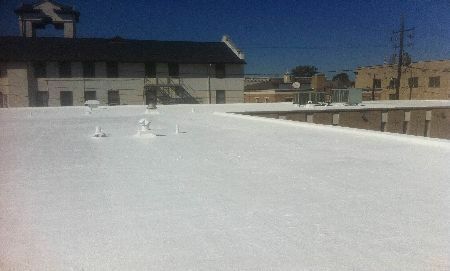 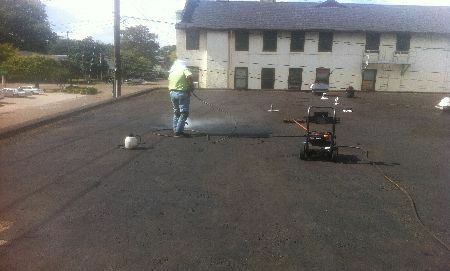 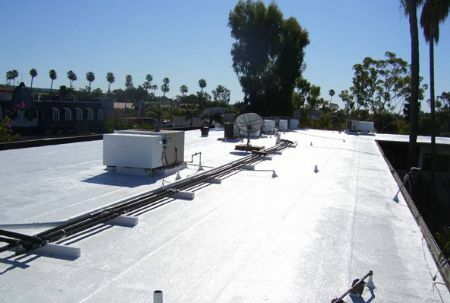 NEWLY TOP COATED SURECOAT ROOF ON DESIGN COMPANY IN TORRANCE, CA. 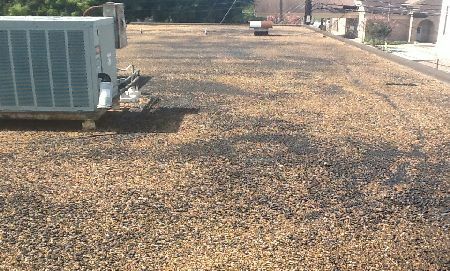 THE WARRANTY ON THIS ROOF WAS JUST EXTENDED FOR ANOTHER 10 YEARS! 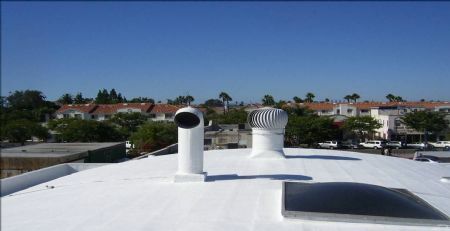 AFTER THE SURECOAT ROOF SYSTEM. 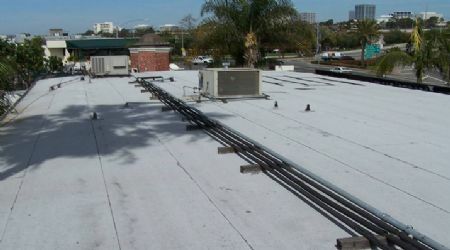 A SOLAR SYSTEM WAS THEN INSTALLED OVER THE SURECOAT ROOF SYSTEM. 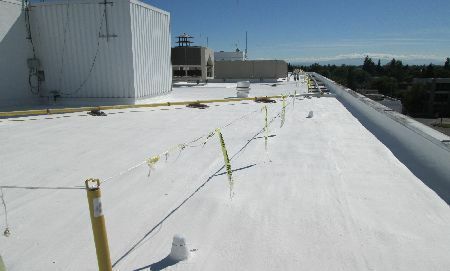 THE SURECOAT ROOF SYSTEMS (SURE-A-THANE) USED ON THIS PROJECT HAS A SRI VALUE OF 108. 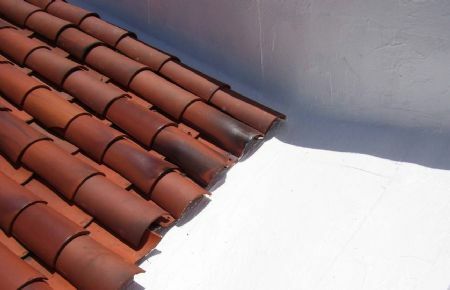 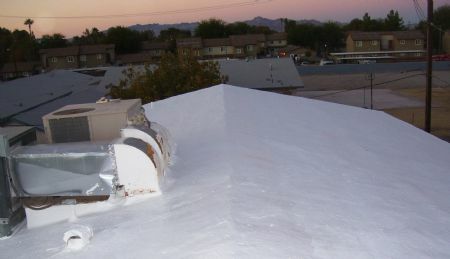 AFTER THE SURECOAT ROOF SYSTEM WAS INSTALLED IN OUR LIGHT TAN COLOR. 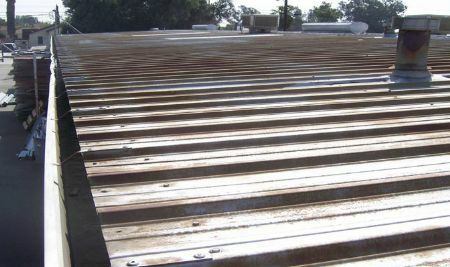 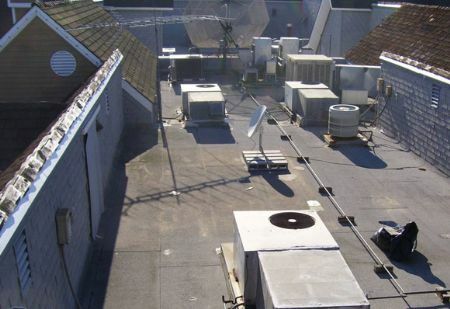 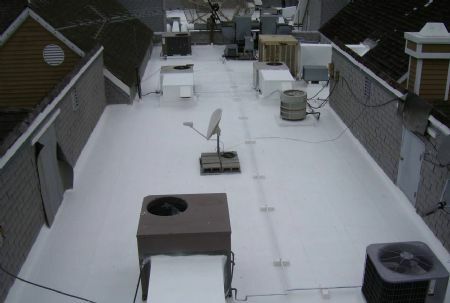 AFTER THE SURECOAT ROOF SYSTEM – ACTUAL CASE STUDY PROVES THAT THE ROOF TEMPERATURE ON METAL SURECOAT COATED ROOFS, SUCH AS THIS ONE HERE, IS DECREASED 35 – 45 DEGREES FAHRENHEIT, DEPENDING ON THE AMBIENT AIR TEMPERATURE AT THE TIME OF STUDY. 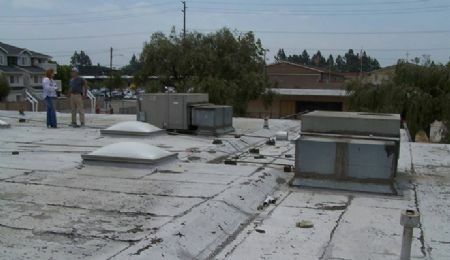 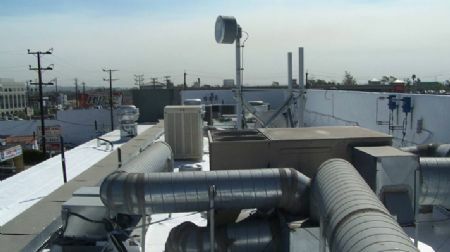 BEFORE – WINE CELLAR AND RESTAURANT WITH CELL SITE ON BUR IN LOS ANGELES, CA. 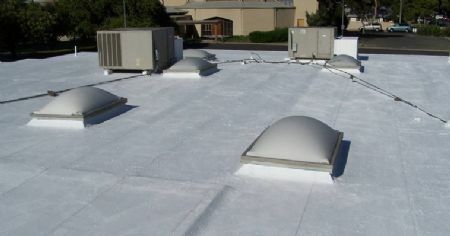 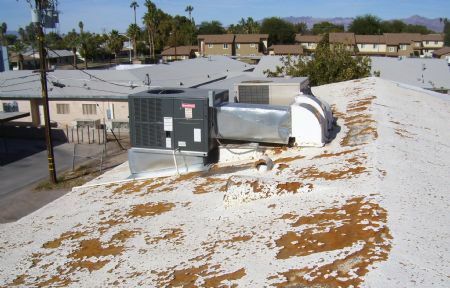 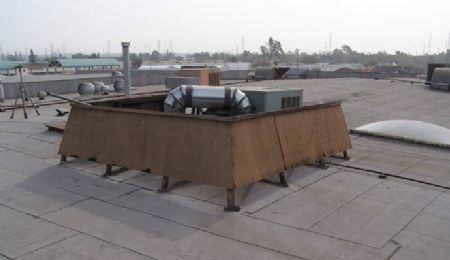 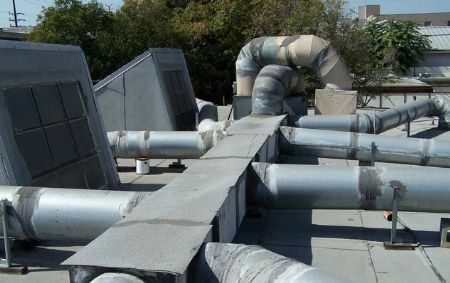 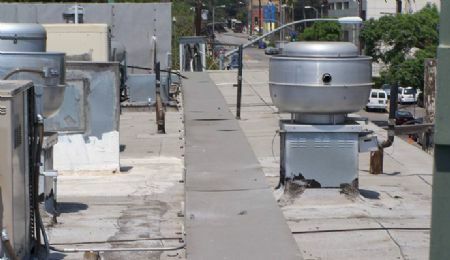 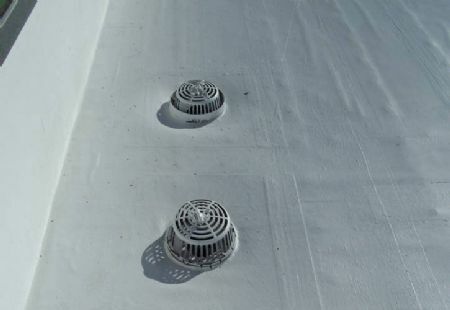 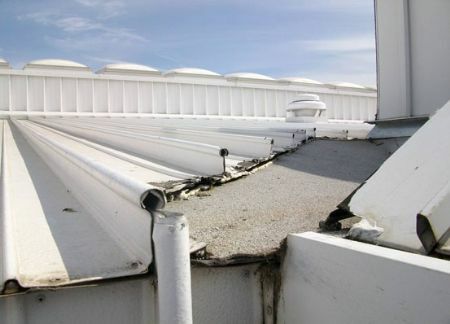 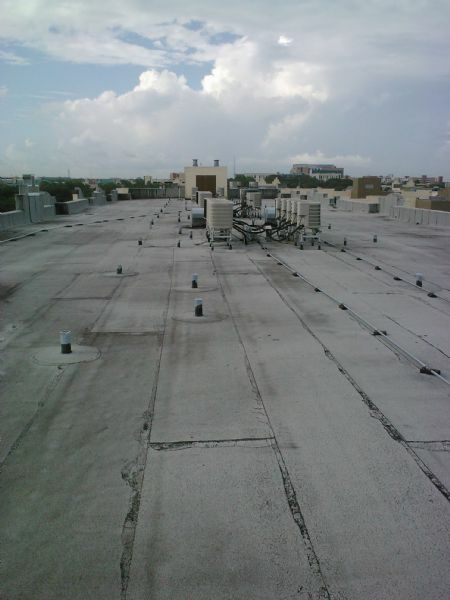 NONE OF THE ROOF EQUIPEMENT WAS REMOVED TO COMPLETE INSTALLATION AND THEIR BUSINESS WAS NOT INTERUPTED. 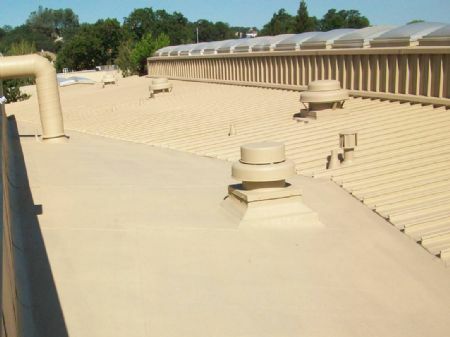 TO MOVE & STORE THE WINE AT THIS LOCATION COULD HAVE COST THOUSANDS OF DOLLARS THAT THE OWNER DID NOT HAVE TO SPEND. 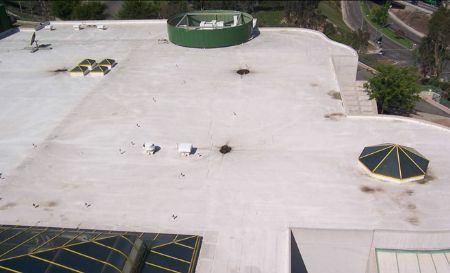 ROOF NUMBER ONE COMPLETED OF A 108 SQUARE LOW-SLOPED ROOF PROJECT USING THE SURECOAT ROOF SYSTEM FOR FLAT COMMERCIAL ROOFS WITH PONDING WATER ISSUES. 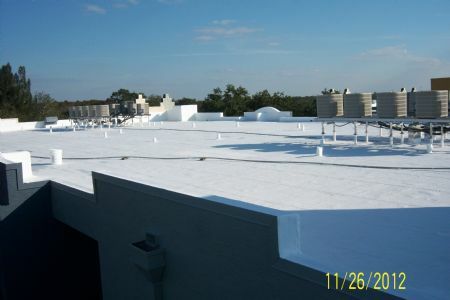 APARTMENT HOUSING FOR A FLORIDA UNIVERSITY IN TAMPA, FLORIDA. 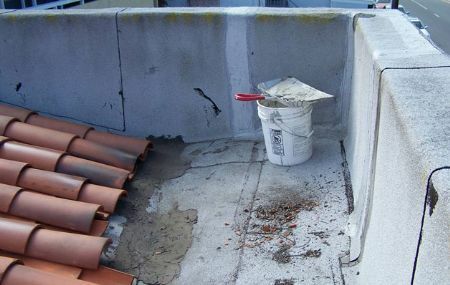 ROOF WAS IN BAD CONDITION AND IN NEED OF A RESTORATION.